Since Attorney General Jeff Sessions tightened US immigration policy on April 6 by issuing a “zero tolerance” order against those trying to enter the country without papers, even for those seeking asylum from domestic abuse and violence, 2000 children have been ripped out of their parents’ arms by immigration agents including toddlers and breast feeding babies. Many of these parents do not know where their children are nor do the children know where their parents are. Recently White House Chief of Staff, John Kelly backed up the policy when he explained that, “the children will be put in foster care or whatever.” This comes at the same time as a new report revealed that there are some 1,500 undocumented children, who have been placed by federal authorities in homes of “sponsors,” and are now missing in the system. No other country has a policy of separating families who intend to seek asylum. “What the US is doing now, there is no equivalent,” said Michael Flynn, executive director of the Geneva-based Global Detention Project, a non-profit group focused on the rights of detained immigrants. “There’s nothing like this anywhere”. Currently there are 140 detention centers in 14 states for the some 10,000 unacompanied immigrant children now held in the United States. 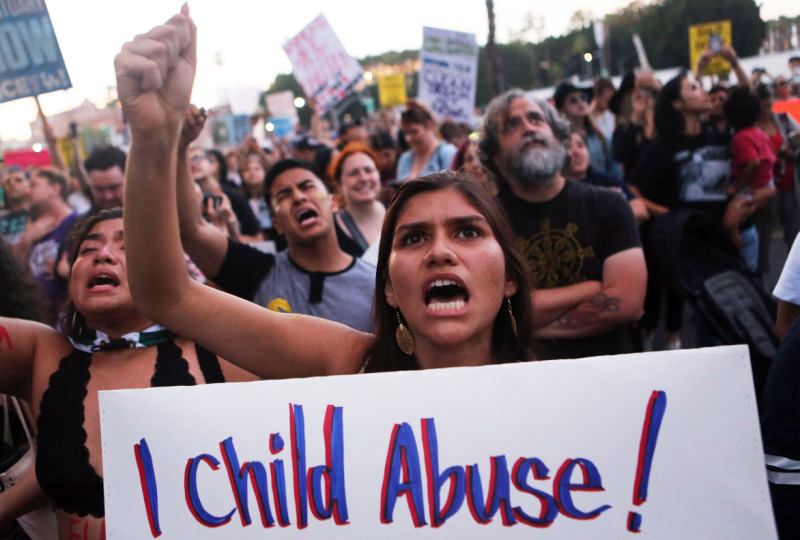 These facilities are over flowing with many of the children being placed in jail holding pens or in tent complexes in the blistering heat of Texas and Arizona. A closed Walmart has been taken over to warehouse 1400 of them in Texas while the Department of Health and Human Services is considering shipping the children to military bases. This is not the first time that the policy of the U.S. government has been to forcibly separate children from their families. Beginning in 1862 and lasting for over 100 years over 40,000 Native American children from 62 tribes were forced from their families into Christian missionary run “schools” separating them not just from their families but from their history and culture as well. The schools emphasis was not on education but on discipline and punishment. The trauma from this mass separation continues in Indian communities to this day. The alarming horror of the inhumanity unfolding in front of our eyes is also reminiscent of another dark and racist chapter of U.S.history when 120,000 Japanese Americans were rounded up and forcibly interned in isolated prison camps in the western interior of the country. Like Trump, President Roosevelt set these orders into motion through an order from the executive branch in 1942. Only 20% of the fathers ended up with their families in those camps. A general outcry is beginning with protests in many U.S. cities and opposition from civil rights groups and many religious denominations is starting to be heard. In what is now a predictable pattern, Trump is deflecting the blame with a bald faced lie, “I hate the children being taken away,” he said. “The Democrats have to change their law. That’s their law.” But wait.. there is no Democrats‘ law that necessitates separating children from their parents. The separation policy comes directly from the decisions made by Trump and his administration; period. Immigration is as old as human history and it is doubtful that the new policy will even slow the flow of immigrants who are fleeing violence and poverty in Central American countries like El Salvador, Guatemala and Honduras when staying, for many, could mean a death sentence. Nobody would want to leave their homes, communities and country if there were other options, but neo liberal policies coming from the very country they are fleeing to has supplanted the independence of their countries with corrupt and subservient governments, and devastated their environments and way of life. Beyond the immediate cruelty of the policy, what is going to be the long term affect on these children? The trauma they will face will be severe and long lasting. Father Michael Lapsley, an Anglican priest from South Africa who was an activist freedom fighter in the struggle to end apartheid in his country, founded the Institute for the Healing of Memories after a letter bomb from the defeated white racists blew off both of his hands, costing him an eye and nearly his life. Since that time Lapsley has become a healer, travelling the world to give seminars and to listen to the stories of those who suffer from various traumas. In a recent conversation he told me that in his experiences he has learned that of all the different types of trauma that people suffer the one that crosses all societies, races and cultures and is the deepest is childhood trauma. About the 10,000 immigrant children now detained in the U.S. The United Nations Human Rights Office has warned these detentions constitute “a child rights violation and should be “halted immediately“.